In keeping with our the desire to continue our ever-evolving culinary endeavors, it was essential to determine what potential resources there might be in Eugene. During my extensive research, I discovered a couple of gems that we tried out on our first trip. Based on many further investigations around the city since we have moved here, I’m pretty convinced these are the “go to” places for all manner of surf and turf. In both cases, you can eat in, take out, or buy fresh to cook at home. We love seafood, but even living near the California coast as we have much of our lives, unless we went right to the dock, most of what we could get was frozen or had been previously frozen. Fisherman’s Market is owned and operated by two Alaskan fisherman, Ryan and Debbie Rogers, which gives the place a certain level of credibility when it comes to fresh fish. 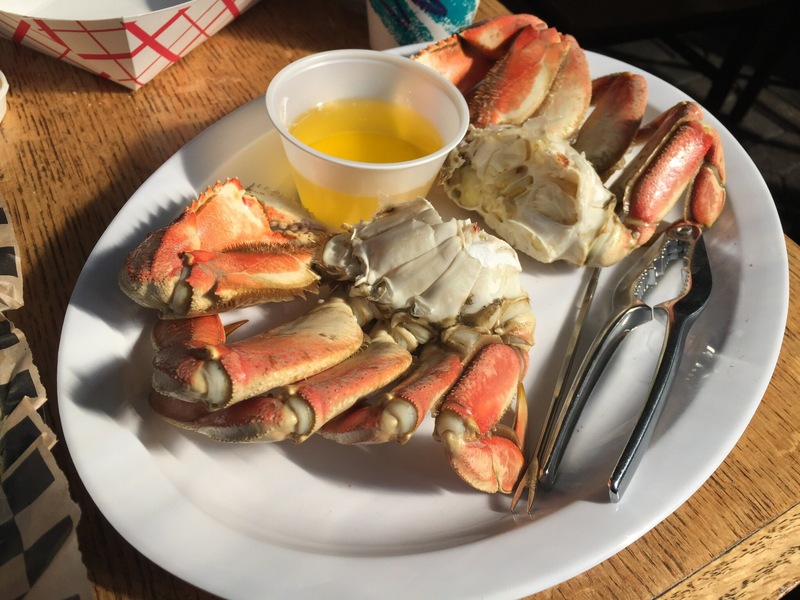 Here you can buy live crab as well as fresh salmon, scallops, and whatever else is in season. That’s the key — buying what’s in season. 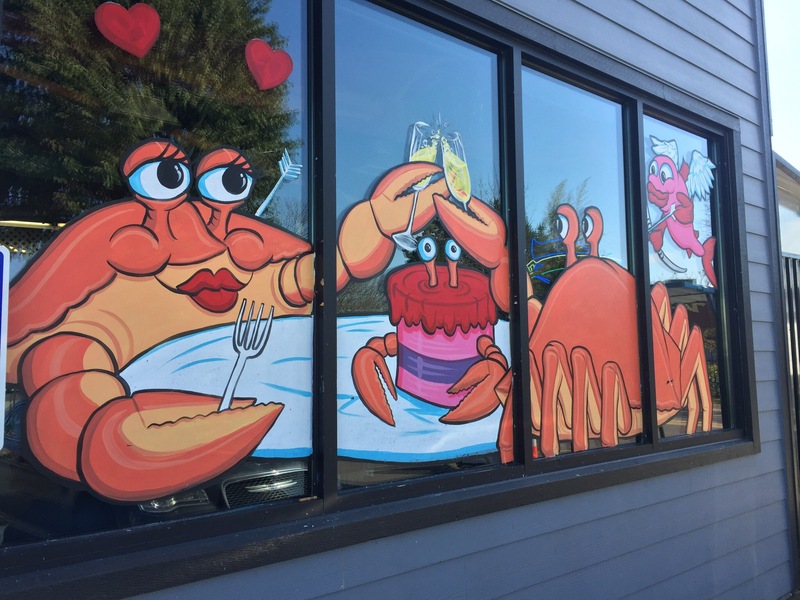 When we first ate here in February, it was crab season. Norman had his first fresh crab ever and it was truly amazing. Since then we have tried other traditional seafood items on the menu such as fish and chips (choices are cod, salmon, mahi mahi, scallop, & shrimp) calamari, crab cakes, drunken clams, and crab cocktail. They make the best clam chowder we have had anywhere. They also serve an array of seafood sandwiches and salads. There are no less than six cocktail sauces from which to choose to garnish your meal, but they’re not really necessary as everything is so delicious on its own — hot, clean, and fresh from the fryer. Best of all, everything is so reasonably priced. To top off that fact, recently we discovered we could order off the “Kids and Seniors” menu. Lunch for two for $7. What a steal! Ah, the benefits of being “older”. 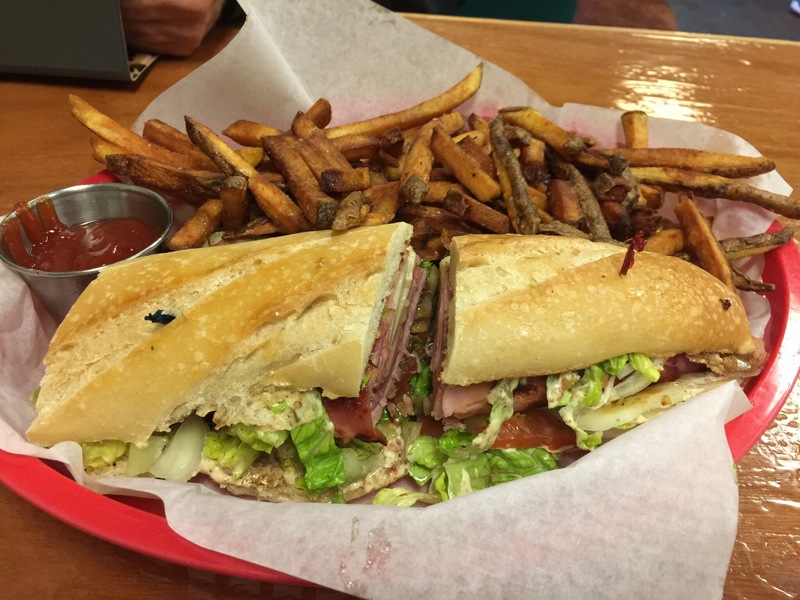 Noteworthy… Fisherman’s Market was featured on Diners, Drive-ins, and Dives of Guy Fieri fame. Check it out if you are ever in town! This market is actually located in the neighboring community of Springfield, home of the Simpsons. 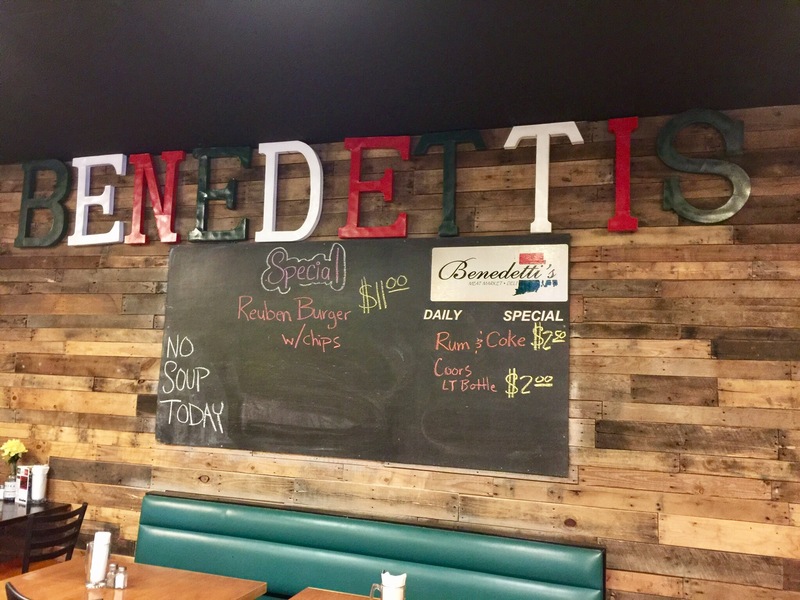 James Benedetti, originally from Rhode Island, opened his market in 2009 and eventually hired his partner, North Bend Oregonian, Mike Richardson as chef for the restaurant. Though not completely local as they contract with Cedar River Farms in northern California for all of their meat products, they focus on preparing dishes with the highest quality ingredients at moderate prices. While not in the fanciest location (a strip mall), the atmosphere is rustic and inviting and the food is definitely delicious. Upon our arrival in Eugene in February, we enjoyed two super generous and satisfying selections from their every-changing lunch menu. Norman had an Italian Grinder like no other and I had a creative take on the BLT, the Smoked Pork Belly BLTA (A = avocado). Whoa! We couldn’t eat this every day, but was it ever tasty! To compliment your meal, there are local beers on tap, Italian wines, and a full bar. Before we left, we perused their deli which featured absolutely beautiful cuts of all kinds of meat and sausage prepared in house at extremely reasonable prices. Recently, we returned to purchase a rib eye for dinner at home along with a variety of those sausages. All were incredibly tasty and tender. They don’t have a website, but you can follow them on Facebook to stay tuned for their daily specials. Above all else, what we noticed about both of these places as we have everywhere in Eugene is that everyone is so welcoming and friendly. Coming from the rat race of the Silicon Valley, it’s rather refreshing to say the least and makes us really happy we have chosen this city for our retirement. Sounds like a wonderful place for retirement, glad to hear you have really settled in.